I myself am a Quality-Net & Zain Ego client, for a long number of years. I have to say I’m quite happy with Q-Net, and haven’t noticed any capping on my 4 Mbps DSL connection. On the other hand, I hated Zain’s 27 Mbps Ego service for years in Chale, till I finally cancelled it after 4 unsatisfying years; and that was like just a year ago, before any capping ever took place. Therefore I can’t really or honestly say that I’ve been negatively affected by either company, in terms of capping. I know bloggers are a community, and it is nice to a part of that when the need rises to be collectively supportive. Then again, blogging is also such an impersonal experience. I saw myself alone when faced with that dreadful DHL thing a few months back. I managed to solve it on my own, and it didn’t really cause a serious problem for me. Therefore; I see blogging as very personal when my readers and commenters are involved, but rath impersonal when fellow bloggers enter the pic. Having said that, I do have to balance the two, the personal & impersonal together. But my decision will always be to genuinely opt helping out the blogging community. This post shows my support. I hope it helps everyone out. Good luck fighting the ISPs. Personal note: Mark, Babbleq8, Bananaq8, Kaifan5, Ims85, 6ofaga, and Saudi newvision: you guys & gals are a huge part of what’s good in the blogging community. I went to Mishref Fairgrounds this evening to renew my Q-Net DSL subscription. The speed I use is the 2-4 MB, which I renewed again for the annual price of KD258, KD8 more expensive than last year. I don’t know what’s up with that. I mean we should be getting better offers, like faster speeds or cheaper rates or something. Anyways, they gave me a scratch card. I played dumb and took two of them. I won two free 1 Tira external HDs. 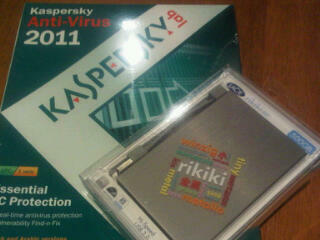 Since they didn’t have it in stock, they offered to give me a portable 500 GB one (with free anti-virus) on the spot. And they were kind enough to turn a blind eye, and gave me two of them, even though I only have a one subscription. I like Q-Net, I rarely have problems with their connection, so I didn’t see any point in looking at offers from other companies (even though I’m not in love with their prices this year). I’m happy with the new external HD, atleast it’s something I know I will be using. As for the speed, I would’ve rather had a faster connection for this price. I was planning on going to Info Connect Exhibition in Mishref Fairgrounds this afternoon, to renew my annual Q-Net DSL subscription. 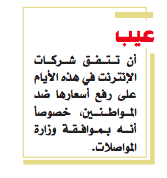 Then I read this comment in Al-Qabas. Are the DSL providers really hiking up their prices this year? Isn’t it bad enough that we pay more, and for slower speeds, than almost everyone else in the GCC?